There are a lot of great interactive animated activities online that were created using Adobe Flash, the multimedia platform that was once the medium of choice to add interactivity to webpages. When iPhone and, subsequently, iPad came on the scene, there was quite a lot of hubbub about Apple's decision to not support Flash on these devices. It turns out that inclusion of Flash really drained the devices' batteries, among other problems. Adobe eventually admitted to this when they stated they wouldn't be developing Flash for even Android devices anymore. In the future, web interactivity is likely to be fostered using web standards such as HTML5, which iDevices are all A-OK with (just try running this HTML5-based activity on your iPad in Safari). 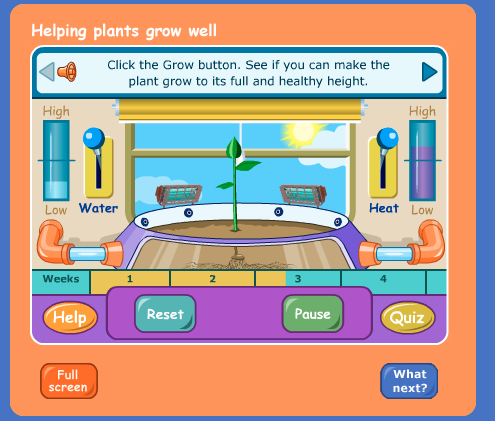 The "Helping Plants Grow Well" activity, in which you add water and heat at the appropriate time to help the plant grow to its full height. When used on a computer, these activities are pretty engaging, but for younger kids, it's really hard to do the click-and-drag necessary to complete it, especially if you are using a newer Mac with a multitouch trackpad (that doesn't have a button). 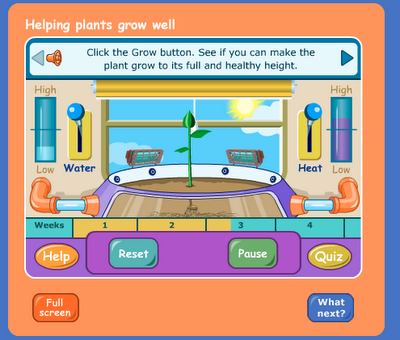 Note that Science Clips activities all come with language-based contextual worksheets, such as this one that goes with the above activity. Enter Splashtop Remote Desktop ($4.99, iPad only). This app allows you to control your computer screen from your iPad, thereby making previously inaccessible flash-based activities function as apps. Here it is in action, with a student of mine easily interacting with the Flash-based Crayola Create & Color website. Here's how it works. Purchase the app from the iTunes store (see link above). After installation, you will be given instructions on how to install a program called Splashtop Streamer on your computer- this will allow the app to control your computer. You will setup the app with a passcode that allows you to connect to your computer as well. After that, anytime you open the app, it will "find" your computer and let you connect and control the screen! To return your computer to its normal state, simply exit the app. I have found this app very useful despite a few caveats I need to offer here, so proceed using your own judgment. 1. You need to have your iPad and computer on the same wireless network for the connection to function. If this is not possible at your workplace, don't purchase the app. 2. I have found on large networks with lots of traffic (e.g. hotel conference centers) where I am trying to demonstrate this to people, it never works. It works well at my school and private practice. 3. Consistently, it takes me like 3 tries of putting in my password to connect successfully. I don't know why. That's Splashtop connected to my computer, which is running Intellitools Classroom Suite, effectively making the iPad into an Intellikeys keyboard! I don't know if they even make Intellikeys anymore (the website says "out of stock"), and I could never get the darn things to work, but I have always liked this software and the Intellitools Activity Exchange. 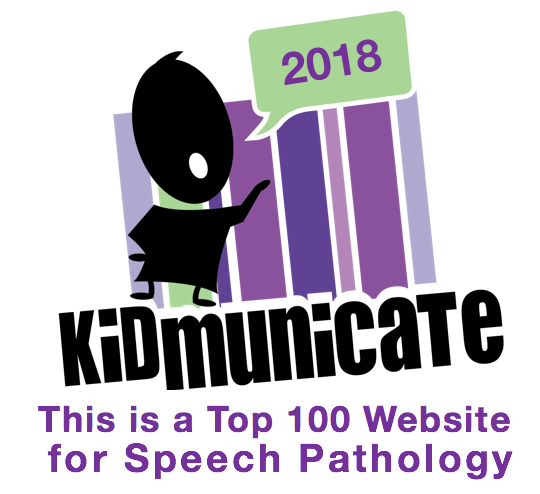 I have a few kiddos who can really benefit from activities such as this "Easy Writing" one, but wouldn't really engage as well with a computer as they would with the iPad. Splashtop to the rescue! I do believe that you can use SplashTop through a VPN for "distance" use. Just have to know how to set up the VPN.